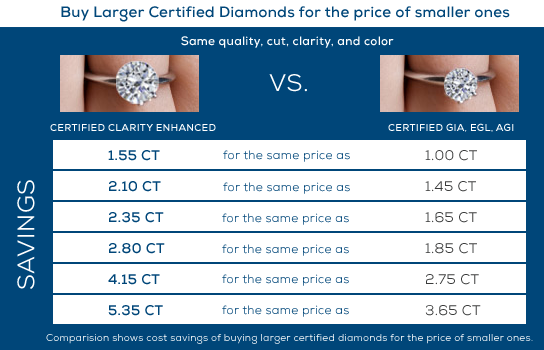 Blog - What is a Clarity Enhanced Diamond and Why Should I Consider Buying One? What is a Clarity Enhanced Diamond and Why Should I Consider Buying One? When it comes to diamonds, every woman appreciates a larger stone. However, when shopping for diamonds, one can find higher clarity graded gems. Costs can start to add up very quickly for those appearing flawless. This is where clarity enhanced diamonds shine, especially if you have a set budget, and still want that larger, sparkling beauty on your finger. All at a much lower price than their natural brethren. The clarity enhancement process takes a gem with a lower clarity grade and creates a stunning, more beautiful diamond with a much higher clarity grade. Only your gemologist will know the difference—not your hairdresser. So, how is it possible to elevate the clarity grade of a natural diamond? There are two proven methods used to upgrade and beautify the diamond. Both processes leave the diamond more brilliant and clean when viewed by the unaided eye. Microscopic feather filling: This application simply seals the feather with a diamond-like, substance. It will not increase the carat weight of the diamond. The process is resilient up to 1,480o F.
Laser drilling: This removes visible black inclusions in a diamond. An infrared laser can selectively target and remove the inclusions on a microscopic scale. This does not affect the sparkle or brilliance of the diamond. Conversely, the laser factor restores the diamond to its fullest, cleanest, most beautiful possible form. These techniques simply remove or make the original inclusions invisible to the naked eye. A clarity enhanced diamond will wear like any other natural diamond. Is a Clarity Enhanced Diamond for Me? "A gorgeous, much larger diamond that suited my budgetary requirements!" "Better color, clarity, sparkle than I anticipated." "An affordable price and quality I couldn’t have imagined!" Where can I see a clarity enhanced diamond? The Hadar Diamonds Preview Service allows you to view a clarity enhanced diamond in the comfort of your own home, without paying. No obligation. To learn more contact us!